I originally wanted to go to The Cheesecake Factory, but the wait was 45 minutes and I was too hungry to wait! So we dined at La Piazza during our visit to The Grove. Service was fast – We were greeted and seated quickly despite having arrived around dinner time. There were a fair amount of empty seats at La Piazza compared to The Cheesecake Factory’s 45 minute wait. But to be fair, they have a patio, an upper-level seating and a lower level seating. It was a pretty big restaurant. After ordering, we were served complimentary bread which came slightly cold and was hard to eat. Also to my surprise, they did not provide any butter or olive oil or balsamic vinegar to accompany the bread. The bread itself wasn’t pre-buttered as well, and most restaurants usually provide one or the other. So I just thought that was odd… Good plain ol’ bread. 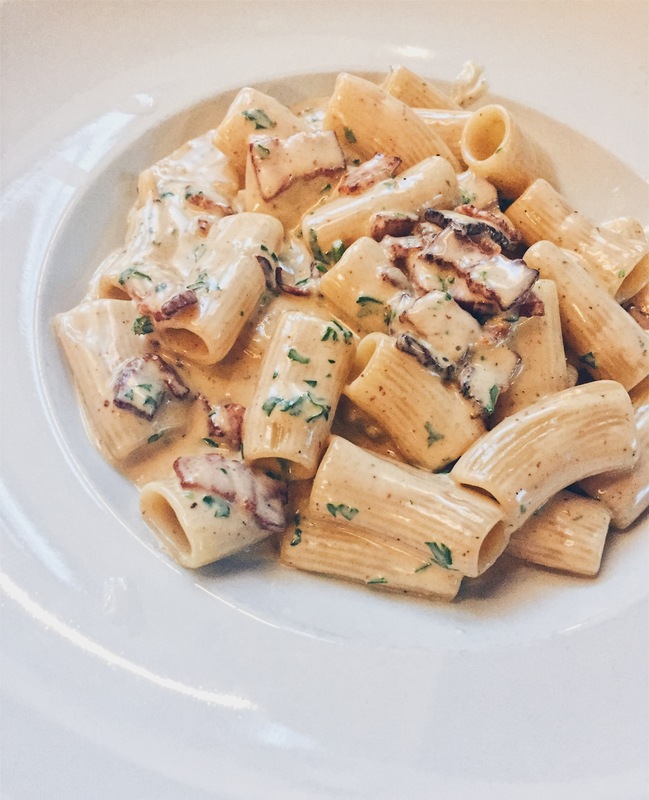 This is their Rigatoni Alla Carbonara, made with pancetta, egg yolk, parmesan and black pepper. I could definitely taste the difference of the carbonara since it was made with pancetta. The pancetta really made a difference in comparison with the other Carbonaras that I’ve tasted. 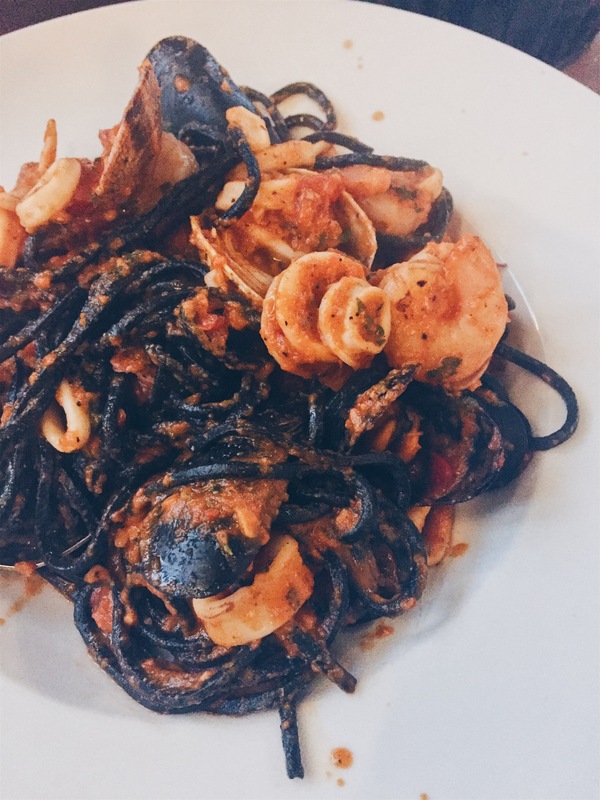 I had the Tonnarelli Neri Ai Frutti Di Mare aka Squid Ink Seafood Pasta. The squid pasta that came with calamari, shrimp, clams, mussels, spicy marinara and lobster broth. My go-to pasta order at a new restaurant is always the seafood option. The Squid Ink Seafood Pasta tasted alright. I didn’t see a difference in the squid pasta compared to a regular pasta. It was really filling and they gave a lot of squids as compared to the other seafood items. La Piazza fulfilled my craving for pasta and definitely an option at The Grove, but I would probably dine elsewhere should I ever visit The Grove when I’m in LA again.